This premium garage is perfect for storing a single car or simple for storage. The garage also has a canopy to the side which ideal for storing bikes etc. 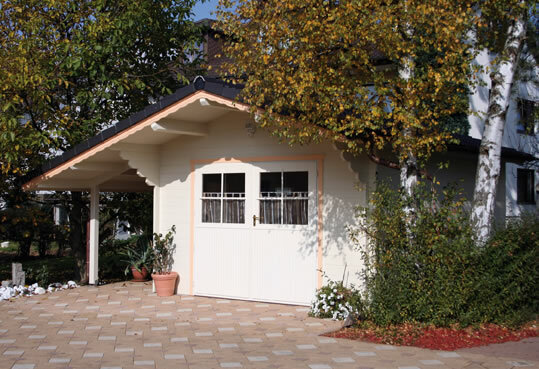 This Quality Bertsch Double Garage is manufactured in the Log Cabin tradition from first class northern European firs. The solid 45mm wall logs naturally gives great insulation and security. This Log Cabin Double Garage also benefits from Double glazed access doors and several window for ventilations whilst maintaining security. Bertsch are dedicated to producing a quality product and have used their German engineering to refine the log cabin design. The wall construction is wind-resistant due to chalet-milling in every corner joint. The Double Tongue and Groove logs have special profiles which make them clip together for higher stability. Unlike other cabins on the market the final wall log is profiled so it fits smoothly with the slope of the roof boards make a weather tight construction and an all round Quality Log Cabin. Upgrading to a thicker log in 70mm or 94mm. Insulation pack for the roof and floor. Pre drilled logs to accept electricity cables. Additional windows and doors or partitions. Double Glazed units. Verandas and terraces. Shutters and oval windows. Curved wall steps rather than square logs. Factory painted doors and windows in a choice of colours providing a base coat and two top coats. Complete bespoke manufacturing allowing you to change the size, shape and design. Quality and Detail: These cabins are the very highest quality buildings on the market today and are a market leader in Europe surpassing all their competitors for longevity, design and attention to detail, please see our support information page or download a brochure for more details. Deluxe Trampoline from Jumpking, 4.3m suitable for weights up to 28 stone. This log shed with attractive lean to is a decorative storage solution. 8'2"x8'2"
Traditional Heavy Duty Pent Shed 9.14x1.83m, a long lasting shed with many optional extras. 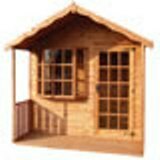 The Buckingham summerhouse 3.05 x 3.66m a useful garden building. The Liverpool Log Cabin built using 44mm logs measuring 3x4m (9'8" x 13'1") is ideal for use as a garden office or as additional family living space. Our Tulip Playhouse measuring 5'x5' (1.52mx1.52m) is a perfect children's accessory for the garden.